Reading Roberto Bolaño’s 2666 again (and yet again, eternally it seems, which is a sort of beautiful curse, or a curse that has no end) and there is a terror, a real terror, to certain lines, and not because of any pyrotechnic language but rather because of the direct plainness of it, as in the very early section where Morini (wheelchair-bound Morini, or perhaps faking to be wheelchair-bound, a heretical reading of the text, I know) has a nightmare about Liz Norton (“when she suffered, her pain was clearly visible”) which makes her a person to fall in love with, a person to love without honor or at least without the codes that govern love without honor, a nightmare that involves a pool (a pool governed by shadows) and Liz and Morini searching for Liz in the fog and afraid that he may topple into the pool and the line “Morini was about to shout again and wave when he sensed someone at his back. 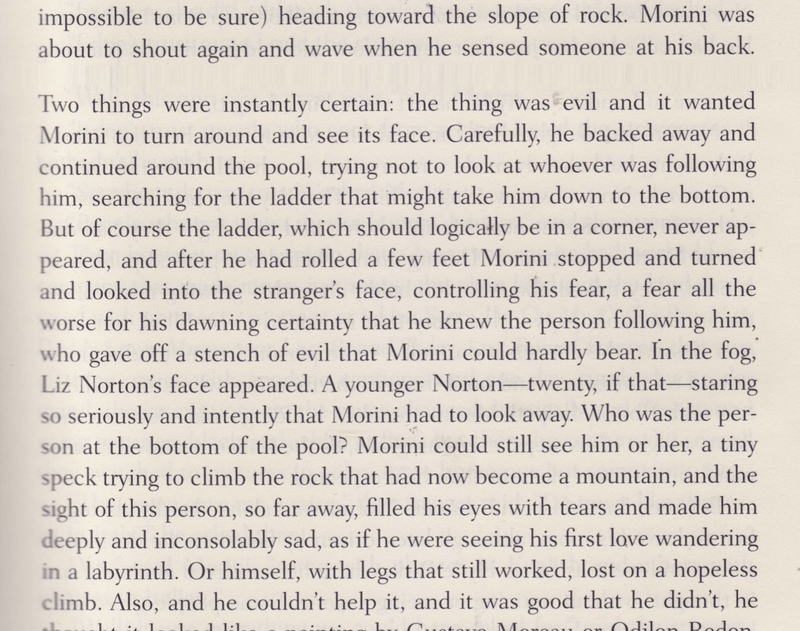 Two things were instantly certain: the thing was evil and it wanted Morini to turn around and see its face” (47). These lines, somehow, correct the world, or a perception of the world, which is to say that the evil here is not of psychology (True Detective recently pushed against this model, until its final episodes, but so much of our narrative today resolves itself around the psychology of the protagonists, as if neuro-science has become the new meta-narrative, or as if psychology were not really the individual expression of a sickness, an aberration, a cosmic aberration that includes [a thought only thought in the darkest of night: humanity itself]) but rather of something at once more cosmic and more banal, as if time itself had leaked back into the world, and in leaking brought with it the rust of pipes.) Of all the recent books (Julia Kristeva’s Powers of Horror and Mezzo and Pirus’s King of the Flies being the exceptions) 2666 comes closest glimpsing evil in both its capital E and lowercase e versions.